You're getting classy. You've served your guests enough Miller High Life. When you entertain, you want to do it with style. It's time to set up a proper home bar. 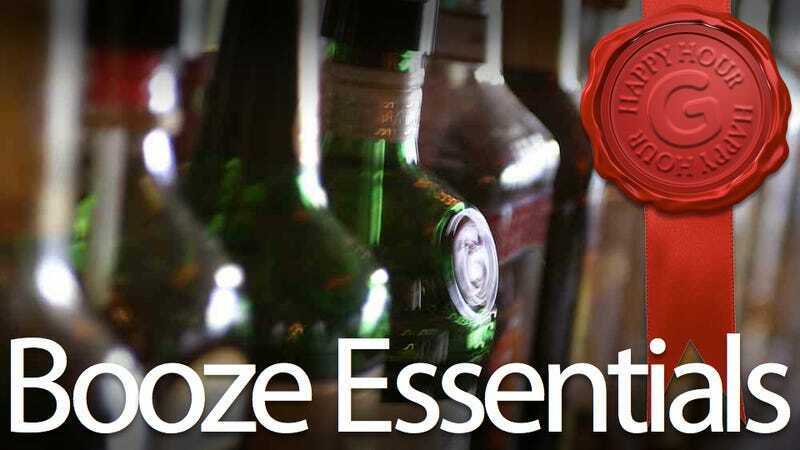 But with such a huge array of spirits, liqueurs, mixers, and other ingredients out there, it's hard to know which type of booze gives the most bang for the bottle. So we analyzed the top cocktails and identified five key ingredients. This is the essential sauce, from a scientific, statistical, slurred-speech standpoint. It's Friday afternoon, you've made it through the long week, and it's time for Happy Hour. Gizmodo's weekly booze column is a cocktail shaker full of innovation, science, and alcohol. Today, we're bringing the bar to you. To determine the top five, we started with a list of 115 commonly ordered drinks. We broke each drink down to its components then put them in a spreadsheet, dividing the ingredients into spirits, liqueurs, and other. We decided to start with a list of popular drinks from About.com. The results were, literally, clear. Vodka dominates the list. It appears in a whopping 37 of the 115 drinks. It's followed by rum, gin, and then bourbon. Bourbon, last? Has the world gone topsy turvy? The most common liqueurs list was even more disturbing. Coffee liqueur? Gah! Really? Three times as popular as sweet vermouth? Maybe our finger isn't on the pulse of mainstream America, but this seems wrong. Very wrong. In the list of other ingredients, bitters only appeared 5 times. We got 16 hits for orange juice and 15 uses for cream. Y'know what? Screw that list. The caliber of my bar is somewhere in the upper-middle of the spectrum. I work in a higher-end hotel bar, and we truly get all kinds of guests. We have a cocktail menu, but we don't specialize in craft cocktails the way the smaller bars do. We have standards: No flavored vodkas, spirit on spirit drinks get stirred, we use all fresh juices, and you'll never get a muddled orange in your old fashioned. Sounds just about right. So, we went again and broke down that list of drinks into their component parts, using the most recent Mr. Boston Official Bartender's Guide for recipes. All right. This is looking better already. Gin and vodka are tied, and bourbon isn't too far behind. We were surprised to see such a low demand for rye, but I guess its comeback hasn't fully gone mainstream yet. The liqueur list was also much shorter, and much less sugary. This time we went ahead and included bitters in the liqueurs category, because Angostura actually beat out all of the liqueurs (though tincture bitters are technically not liqueurs). This restored our faith in humanity. Don't get us wrong, we love a good Black Russian, but there's no way coffee liqueur should make it to the top five. No way. Even the list of other ingredients is much more pleasing. Way to keep it classy, folks. Okay, so what can we divine from all of this? What are the must-have bottles? Of course, ultimately, it boils down to personal taste. If you know you love whiskey drinks, you're going to lean brown. The goal of this exercise is to determine the best home bar starter kit for general usage. Vodka. Gin. Bourbon. Bitters. Sweet Vermouth. Vodka: Belvedere is very good, but it sure ain't cheap. Tito's is also very good, and it is cheap. You can't go wrong either way. Avoid Georgi. That is strictly for experimental purposes. Gin: You know how, generally, microbreweries make more distinctive beers? Well, micro-distilleries are popping up everywhere, and they often make better, more distinctive gin. Case in point, the brand Brooklyn Gin is fantastic. It tastes incredibly fresh and delicious. For more widely available types, you cannot go wrong with Hendrick's. It's delicious and complex. If you want something also great, but simpler, go with Plymouth. And if you want to go a cheaper route, we have a lot of love for Beefeater, and it's about half the price of those others. Bourbon: Bulleit. It's delicious, reasonably priced, and easy to find. Not only that, it's incredibly versatile. Bulleit has a higher-than-usual rye content (28 percent of the mash—Maker's Mark has zero). That makes it usable for traditional rye drinks, like old fashioneds. That said, many Gizmodo writers have acquired a taste for real rye. Bulleit makes a great one, and Sazerac and Templeton are classics. Bitters: If you're only going to get one bitters, get Angostura. It's the most ubiquitous bitters in the world and many cocktails call for it by name. If you want to expand your bitters collection, grab yourself an orange bitters and go from there. Sweet Vermouth: If you think vermouth is nasty, you've probably been drinking the bad stuff. In fact, a good vermouth is actually drinkable on its own (that's what they do in Italy). Carpano Antica is a fantastic sweet vermouth. Dark, complex, delicious. Adding that to your bar will class up the joint. That said, Dolin is a gold standard. Its sweet vermouth and bianco vermouth (a sweet white) are both excellent, and they can be purchased in smaller bottles, because you prooobably don't need a ton of it. If you want a dry vermouth, go with Dolin's dry. Those five will give you a great foundation for your home bar. From there, build drink by drink. For example, if you're craving white russians some night, add a bottle of Kahlúa to your collection. Feeling margaritas? Grab some tequila. Wanna bust out a negroni? Get yourself some Campari, son. Your collection will expand, organically, as your tastes do. What essentials stay stocked in your home bars, dear readers? What did we miss? Let us know in the comments. And make sure you check back next Friday for another Happy Hour. Big thanks to Anne-Louise Marquis for her input. Her blog, The Tendency, is fantastic.